Permaculture as a system was developed by the Australian scientists Bill Mollison and David Holmgren and their associates during the 1970s and published thereafter. 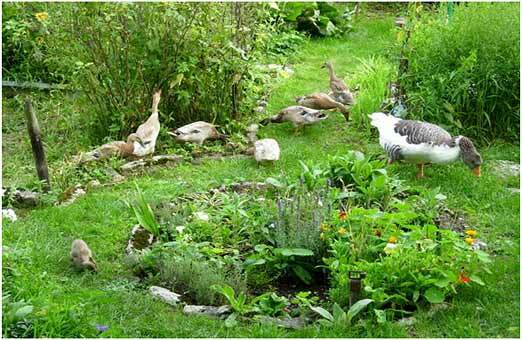 The word permaculture comes from permanent agriculture. The intent is that, by training individuals in a core set of design principles, those individuals can design their own environment and build increasingly self-sufficient human settlements — ones that reduce society's reliance on industrial systems of production and distribution that Mollison identified as fundamentally and systematically destroying Earth's ecosystems. Permaculture principles draw heavily on the practical application of ecological theory to analyze the characteristics and potential relationships between design elements. Each element of a design is carefully analyzed in terms of its needs, outputs, and properties. For example chickens need water, moderated microclimate and food, producing meat, eggs, and feathers as well as manure which can help break up hard soil . Stacking or layers in a forest garden. In permaculture and forest gardening, seven layers are identified. This way diferent kind of plants and trees will grow mixed together, like in a forest. This will create it’s own eco-system which is optimal for the ground and ground water. A mature ecosystem such as ancient woodland has a huge number of relationships between its component parts: trees, understory, ground cover, soil, fungi, insects and other animals. Plants grow at different heights. This allows a diverse community of life to grow in a relatively small space. Plants come into leaf and fruit at different times of year. Layering in a temperate garden, Mount Kembla for example, in the UK, wild garlic comes into leaf on the woodland floor in the time before the top canopy reappears with the spring. A wood suffers very little soil erosion, as there are always roots in the soil. It offers a habitat to a wide variety of animal life, which the plants rely on for pollination and seed distribution. The productivity of such a forest, in terms of how much new growth it produces, exceeds that of the most productive wheat field. It is in this observation — of how much more productive a wood may be on far less fertilizer input — that the potential productivity of a permaculture design is modeled. The many connections in a wood contribute together to a proliferation of opportunities for amplifier feedback to evolve that in turn maximize energy flow through the system.